Refinement Has a New Name…. All audiophiles search for the same qualities: Verisimilitude to the original event, a sense of engagement promoting suspension of disbelief, a visceral immersion in the audio video experience. They also know that everything in the signal path makes a difference, and that includes speaker binding posts. Furutech’s revolutionary, patent-pending FT-860 Series One-Piece Wire-Wound Binding Posts are ideal for speaker builders, manufacturers and do-it-yourselfers looking for low-mass, quality engineered and superb-sounding terminals. The FT-860 Series is a first in speaker terminal design: The reduced metal mass of the binding post terminal pole piece lowers impedance values improving the sound even more. It’s easy enough to follow a trend like low-mass binding posts — less is more — but Furutech engineers weren’t satisfied with merely cutting away material and moving “new” and “improved” out the door. It has to work impeccably and sound glorious. 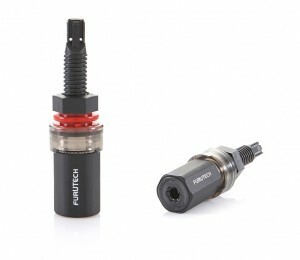 Only Furutech has the expertise of materials, engineering horsepower and advanced processing to create products like the FT-860 Series with its innovative one-piece wire-wound conductor.